3528SMD Single Color LED Strips in 16ft Reels that have adhesive backing and are waterproof. The 5050SMD LEDs are slightly larger than the 3528SMD LEDs so they are brighter. 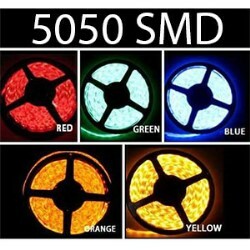 The 5054SMD LEDs are slightly larger than the 5050SMD LEDs so they are brighter.